Size 6 - $40.99 Only 7 left! Size 8 - $40.99 Only 6 left! Size 9 - $40.99 Only 4 left! Size 10 - $40.99 Only 1 left! Do you know how to bombershay? It's goes like this: and one and two and three and four. Got it? Good. Okay, let's try a Buffalo, it's a simple one and two but cross your foot in front. Wait. Are you confused? Sorry, these are tap dance moves. They are pretty darn simple but when you're simply reading a description for gorgeous sparkly shoes on a costume web site you aren't expecting to stumble over dance moves. The thing is, it's impossible to describe these shoes without first thinking about the classic dance moves of retro movies. Here's a thought, did everyone know how to tap dance before the fifties? Those old school musicals make a complicated buffalo dig toe drawback combination look simple. How did they do it? We're thinking that their classy footwear had something to do with it. 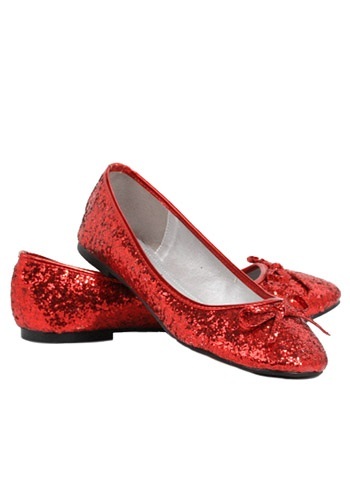 We're not saying these shoes with their red bow and sparkles will give you natural dancing feet but we do know they'll give you that classic movie flare. They don't have taps, their soles are simple black rubber, much more comfortable for skipping down brick roads. Pair these ruby slippers with a sassy black number, a stunning red dress, or if you're feeling adventurous, a blue checkered dress. With those dancing feet, you never know where you'll end up!